CBS News will host the second Democratic primary debate Saturday evening, along with CBS News affiliate, KCCI, and the Des Moines Register. Twitter has partnered with CBS News for the debate, and it will provide real-time data and bring live reactions and questions from voters around the country onto the debate stage. Saturday's contest -- between Hillary Clinton, Bernie Sanders and Martin O'Malley -- is a field winnowed by two since the candidates last met. Jim Webb and Lincoln Chafee ended their race for the Democratic nomination. 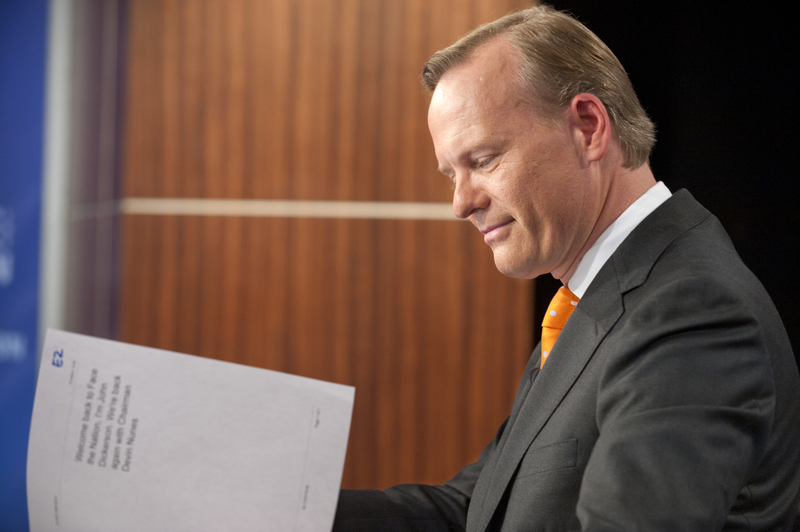 "Face the Nation" anchor John Dickerson will be the principal moderator, and he answered a few questions about what he hopes that voters will see and hear in this debate. What is your goal as debate moderator? John Dickerson (JD): To be a window. The voters should see the voters through our questions and I hopefully won't do anything to get in the way of that commerce. We know the candidates are preparing for the debate and that you are, too. What have you been doing to prepare? JD: I've been doing interviews, reading, looking into their positions and looking back on some journalism that I've done over the years addressing these issues of what can we learn about candidates during debates. What is the most important topic for the candidates this election? JD: The Middle Class squeeze - why it's happening and how to stop the stagnation of wages and increase of prices in their lives. Is there a single issue that you'd like to know more about from the candidates that you don't feel has been sufficiently explored so far? JD: Their views on the choices that presidents have to actually make in office. Where do you think the greatest disagreements lie between the three remaining candidates? JD: They have a disagreement on gun control legislation, health care, foreign policy and how best to change the market so that it stops producing income inequality. How much do you think a debate can influence the course of an election? JD: Not very much, but it can illuminate ideas and help people feel like they have more control over their lives and understand the issues. How are social media affecting the 2016 campaign? Who has the most at stake in this debate? JD: They all have something at stake, but Hillary has the most at stake because she is the one who is farthest ahead. What role will Twitter play in this debate, and will you be Tweeting during the commercial breaks? JD: No Tweeting for me! Twitter will be giving people a chance to provide us with the questions they would like to ask the candidates. What role has Twitter played in this election? JD: It's one of the common spaces where people experience and debate this election. It's also the place where people go when they watch political events.